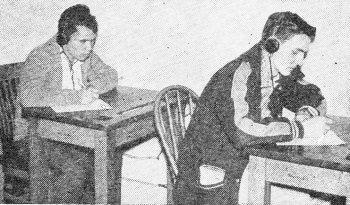 Being able to pass a 5 words-per-minute (wpm) Morse code test at one time was a primary requirement for obtaining the lowest level amateur radio operator license - Novice Class - in addition to passing a written test. Many more people failed the code test than failed the written test. 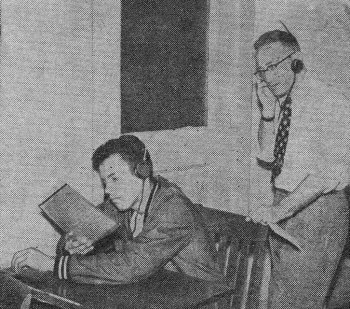 In fact, the code portion kept many aspiring amateur radio operators from ever even taking the test. It was a barrier which anyone worthy of the brotherhood must overcome. The intimidation factor was pretty significant. As time marched on and the ranks of amateur license holders was dwindling quickly, the Federal Communications Commission (FCC) in 1990 dropped the code requirement and created the Technician Class license that required only the passing of a 35-question true/false written test. Amateur license holders began increasing immediately. This story from the pre-no-code days describes the preparation for earning a General Class license. 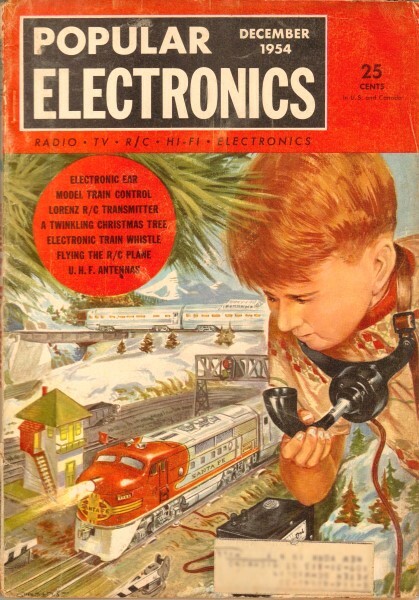 It is the last of a 3-part series published by Popular Electronics during its first three months of publication in 1954. Part 3. "Buck Fever" is a common ailment among prospective license applicants - don't let it get you. Charles Finkleman, radio license clerk in the New York FCC office, adjusts speed of automatic tape sending machine to 13 words-per-minute. Two ham license applicants take the code receiving test at the New York Office of FCC. If applicant passes receiving test, he is required to demonstrate his "fist" for examiner. Hunters who are anxious to bag a good trophy during the Fall season will practice on a target range all summer to perfect their hold, their trigger squeeze, their judgment of the wind, etc. Then what happens when they actually get into the woods? In many cases, the first time they see a vulnerable animal they can't make the sights stand still, they jerk the trigger off badly, and they virtually collapse into a state of nervous prostration. There's an old name for this affliction: buck fever. Exactly the same thing seems to happen to many prospective hams. They'll practice the code until they can copy as fast as they can write. But when they get down to the nearest Federal Communications Commission field office for the 13 words-per-minute test for the general class license, their ears block up and their fingers freeze on their pencils. In most cases this condition is common nervousness, but sometimes it isn't. "Too many people rush down after the first time someone checks them off at what they think is thirteen-per-minute. They don't make enough allowance for timing errors, or for the fact that they take the test in strange surroundings. They should protect themselves by becoming really proficient at full fifteen words-per-minute before they try our thirteen. We don't depend on uncertain hand sending. We use an automatic tape machine that is periodically checked for timing accuracy. When it's adjusted for thirteen, it sends at thirteen, no more, no less, When a failing applicant grumbles a little and infers that the sending sounded sort of 'fast,' we just smile." One nice thing about the FCC code test is that an initial failure doesn't wash you out completely. Just wait thirty days, practice in the meantime, and try again. Three or four attempts before success is achieved are not unusual, says Mr. Finkleman, and he can recall some slow but persistent learners who made it after nine tries! An important fact to bear in mind is that you wear earphones for the test. Many would-be hams do group practice with a loudspeaker working off an audio oscillator. This is fine, but the signals are likely to sound somewhat different when you put on a strange pair of "cans" (as hams call earphones). It is therefore advisable to do your final practice with phones, to get their feel on your head. Actually, you'll find them an advantage, because they shut out room noises. The FCC tape runs for five minutes without interruption. The words of the text are "clear" (that is, real words), but they aren't necessarily connected to form completely understandable sentences. This is done to prevent you from guessing at words and filling them in. You don't have the time for this anyway. The instant the tape machine stops, an FCC man rushes by and picks up all the papers. Contrary to the general impression among applicants, you don't have to copy the entire text correctly. You pass if anyone minute of the transmission is copied down properly. Don't get into a lather, therefore, if you stumble over the first groups of words. Don't attempt to backtrack on them, but relax and concentrate on what's coming. You can afford to spend the first minute or two just listening, getting onto the swing of the transmission, and calming down the butterflies in your stomach. Then when you start copying, make it good. If you flunk the code receiving test, you're finished for the day, right there. You cannot take the written and hope for a passing mark based on a good average. If you pass, the FCC inspector will listen to your keying for a few seconds, and then give you the papers for the written test. By this time you'll be completely at ease. It's comforting to know that very few people who pass the code fail to make the written. The latter consists of 45 multiple-choice type questions, each of which has five choices. To answer a question, you merely identify by number one of the five possible answers. Some of the questions, usually about five of them, require you to draw diagrams of simple radio equipment. The questions are mostly technical, but involve nothing that you won't find in any ham manual. There's no particular time limit, but you must finish the test at one sitting. You can't go out for lunch, look up some of the answers you don't know, and then come back and check them off! An hour is good average time, and many people breeze through it in thirty minutes. The written test is usually graded immediately, and you are notified if you passed or failed. If you passed, you have nothing to do but wait for your papers to be processed in the main FCC office in Washington. The license is issued and mailed from there, not from the regional FCC office in which you appeared for the examination. This may take a month or more, so just be patient. You cannot go on the air until the ticket arrives, and you won't know what your call letters are until you see the license. It's a waste of time to ask for specific combinations of letters to match your initials, nickname, or anything else. The calls are issued in rotation, and one is as good as another. If you failed the test, you can return in 30 days for another go at it. 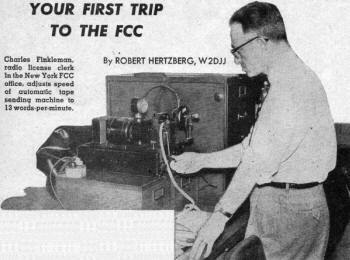 As mentioned in the first article of this series, you are required to take the test in person at an FCC office if you live within 75 miles of it. If you live farther, or are physically disabled, or are serving in the Armed Forces, you can take the test before a volunteer examiner exactly as prescribed for the Novice and technician grade licenses in that article. In some states you can get special automobile license plates to match your radio call letters. Your license is all the documentation you need. The list of states offering this privilege is growing rapidly. Inquire at your nearest motor vehicle bureau. There is usually a small extra fee for the plates, but it's certainly worth it.